In a large jug blend ice cream and milk, add in 2 tbs of rose syrup and 1 tbs of elatchi syrup (or liquidize). 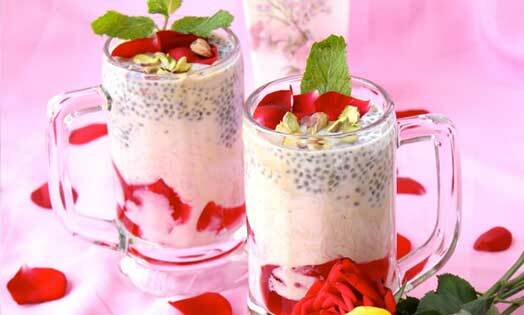 Add sabja seeds, and serve topped with a small scoop of ice cream & slivered almonds. Optional- add cream in too, but the drink is rich enough without the cream. The sabja seeds have fascinated me since I was little, they resemble frogs eggs after they are soaked but have a cooling pleasant texture as you swallow them.